Here you will find lots of useful information for your holiday in Praia da Luz, in western Algarve, Portugal! See how to get to Praia da Luz from Faro Airport by transfer, bus or taxi and how much it costs, print off useful telephone numbers to take with you on holiday and see where the tourist information office is. You can also check out the opening hours for supermarkets in Praia da Luz. Plan your journey from the Algarve's international airport in Faro with our Praia da Luz travel information! Transfer from Faro by Taxi: 89€ for a 4 seater Mon-Fri 6am-9pm (111€ outside this time and bank holidays); 114€ or 137€ for a 6 seater depending on time. To get to Faro train or bus station (which are close to each other just before Faro marina) either get the bus from the airport (the stop is right outside the 'arrivals' doors) and will cost you around 1.95€, or get a taxi at a cost of around 10€. To check train timetables visit the C.P. website. (the site is available in English) and select 'Regional and Inter Regional services' to get the timetable for Lagos/Vila Real de Santo António/Lagos. Book Algarve car hire to travel to Praia da Luz! If you want to book Algarve car hire to travel to Praia da Luz then it couldn't be easier! 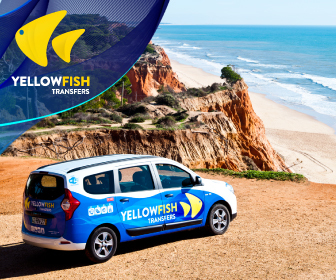 Simply collect your car from Faro Airport and drive down the A22 motorway (a toll road) or down the secondary N125 road to Praia da Luz in western Algarve. Baptista - Opening hours Monday to Saturday: 8.30h to 20.00h, Sundays:9.00h to 13.00h. SPAR - Rua Ema Vieira Alvernaz, Edificio Luztur.